Like many of you I have a Bucket List. A list of places I hope to one day visit and things I’d like to do and accomplish. But I have another Bucket List – it is a list of things I hope to one day eat. One of those things I hope to eat one day are Beignets at Cafe Du Monde in New Orleans. Originally established as a coffee stand in 1862 Cafe du Monde is open seven days a week, 24 hours a day and located in the French Quarter. It is famous for its cafe au lait and it’s french beignets. 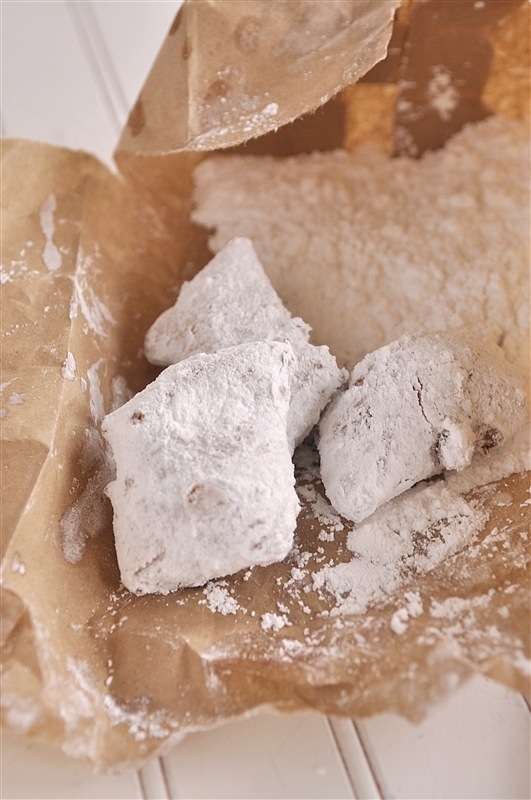 Beignets is french for bump and is basically a piece of fried dough tossed in powdered sugar. They are best eaten warm and fresh. One tip, when eating a beignet, don’t wear black. With all that powdered sugar they are a bit messy to eat but so worth it. I have never actually eaten a beignet at Cafe du Monde but Portland use to have a small New Orleans inspired cafe that I loved and that made amazing beignets but unfortunately they have closed down. When Tessa was in town a month or so ago we went on a beignet hunt. There are a couple of food carts here that make them but much to our disappointment neither cart was open the day we went looking. So I decided when all else fails – make your own! And that is just what I did. I googled a recipe for Cafe du Monde Beignets and made my own. I discovered that one of their secrets is that they fry their beignets in Cottonseed Oil which I couldn’t find so I just used plain old vegetable oil. After mixing up the dough I rolled it out thin and cut it into squares. 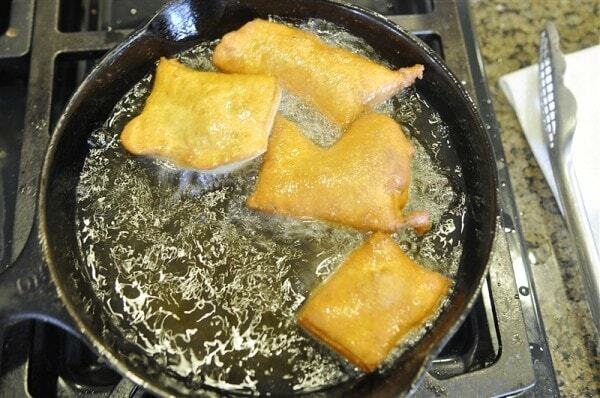 The dough is then fried in hot oil. Be sure and regulate your temperature with a thermometer. One clue that you are doing things right is that the dough will float right up to the surface after you put it into the oil and begin to puff up like a pillow or a bump (thus the name!) Another tip I learned from watching a few You Tube videos was to give the dough a oil bath as it cooked. Take your spoon and gently splash oil onto the top side of the dough so that it is actually cooking too. You want them nice and golden brown and puffed up. 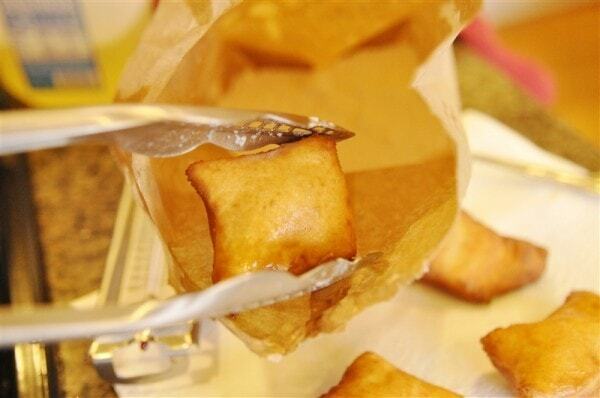 Remove them from the oil and put them immediately into a brown paper bag full of powdered sugar. Shake the bag to coat and then be ready to eat and enjoy! Remember, you must eat these fresh and warm!! And I can pretty much guarantee you won’t be able to eat just one. When you bite into this yummy, sugary goodness the inside will be nice and airy! So hopefully one day I will get to Cafe Du Monde where I can partake of the real thing but until then the next time a beignet craving arises I don’t have to go looking for an open food cart. I can take care of it right here at home! 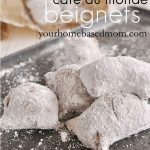 The recipe makes a lot of beignets – probably about 50 or so but the dough can be refrigerated for several days so you can enjoy them all week! What’s on your Food Bucket List?? Put the warm water into a large bowl, then sprinkle in the yeast and a couple teaspoons of the sugar and stir until thoroughly dissolved. Add the rest of the sugar, salt, eggs, and evaporated milk. Beat in the shortening, then add the remaining flour, about 1/3 cup at a time, beating it in with a spoon until it becomes too stiff to stir, then working in the rest with your hands. 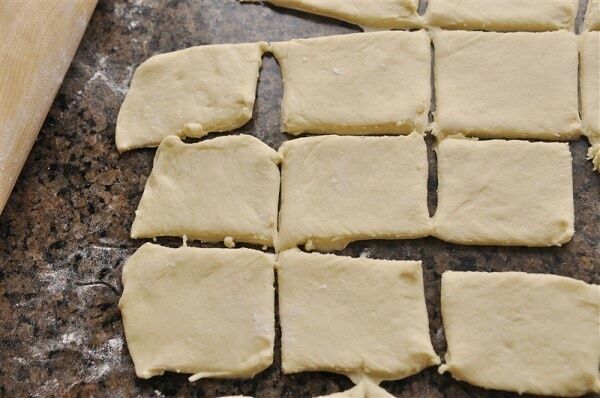 Roll the dough out onto a floured board or marble pastry surface to a thickness of 1/8 inch, then cut it into rectangles 2 1/2 inches by 3 1/2 inches with a sharp knife. Heat the oil in a deep fryer to 360 degrees F.
Fry the beignets about 3 or 4 at a time until they are puffed out and golden brown on both sides, about 2-3 minutes per batch. 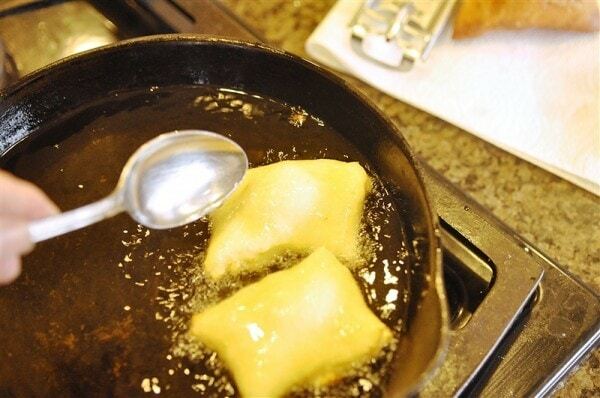 Turn them over in the oil with tongs once or twice to get them evenly brown, since they rise to the surface of the oil as soon as they begin to puff out. After removing from oil put into a brown paper bag full of powdered sugar and shake to coat. Dough can be refrigerated for several days. We spent our 20th wedding anniversary in New Orleans, and yes, those look JUST like the beignets at the Cafe Du Monde! It was on my list, too. You can fry the beignets in peanut oil, and they turn out lovely. Beignets at Cafe Du Monde will be a memory I’ll never forget. I was just mentioning them to a friend a few days ago… and I last visited the Cafe back in the mid-80’s! Truly amazing to watch them being made too. If you like shellfish, try the etouffee while in New Orleans. Amazing! I cannot wait to try these. 15 years ago I lived in New Orleans for a month for an internship and was very glad Cafe Du Monde was open 24 hours a day! 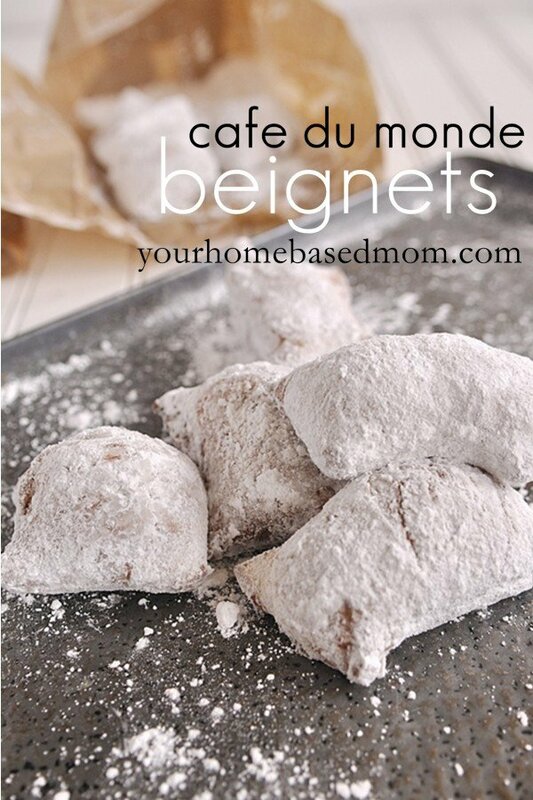 I’ve always wanted a recipe for their beignets so that my husband and kids could try them. *sigh* I think I need a trip back to N’awlins soon! 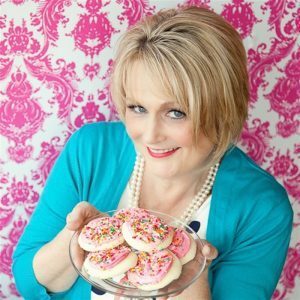 Just remember Gloria – I can not be held responsible for any weight you may gain when you want to eat the whole batch!!! Enjoy. I grew up on Jello!! I’d love to karielyn! hopefully I’ll make it there soon!! Totally checking out your blog – my gluten free, dairy free daughter is home this week and I’m looking for some fun new recipes to try for her. My husband proposed to me in New Orleans, and we went there on our honeymoon, too. You cannot imagine how much weight I gained from eating these beignets every morning, and washing them down with a huge cup of cafe au lait… the chicory kind they make there. Oh, yum. 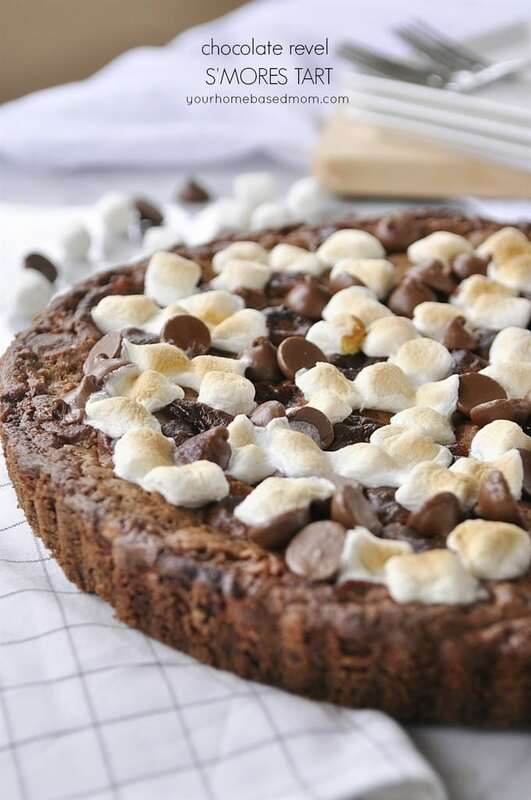 Thank you for sharing this recipe with everyone! Oh, and I wanted to invite you to join my How To Tuesday link party, if you haven’t already. It’s open until next Monday, and the entries are randomized, so everyone’s entry can make it to the top. It would be great to have you! katie – can’t even imagine how much weight I would put on!! I think I could eat them at every meal. How fun that New Orleans is where your husband proposed! Thanks for the invite to the party too. Those look delicious. I lived in Atlanta for about 22 yrs. and during that time there was a Cafe Du Monde in underground. I don’t even know if underground is still there. They are soooooooooo good! I was going to mention using peanut oil as well. I never cook with anything else. Makes fried foods taste delicious. My husband and I spent our honeymoon in New Orleans many,many years ago. We must get back there soon! (approx $2.75/each or around $26-$30/dz) and there’s usually a line but it’s a FUN place to visit so you have to give it a try. Among my favorites are the Meyer Lemon and Lime doughnut, the Passion Fruit with Cocoa Nib and the Maple Bacon – YUMMMMMY!!! Will definitely add Grand Lux Cafe to the list. I have had Blue Star on my to visit list for a bit now! Now I definitely need to get there! Thanks much!! My name is Leigh Anne too, woot! And I’m from Louisiana, about 45 minutes from New Orleans and Cafe du Monde is awesome! I don’t know if you know, but you can purchase some of their products through their website or through Amazon. We moved from Louisiana to West Virginia about 10 years ago and the food is by far what I miss the most! Love that you even spell it the right way! Thanks for the tip about Amazon. Will check it out. We took our 10 kids to New Orleans for 2 weeks for Christmas 2006 and did a lot of ministry to people one year after the hurricane. We visited Cafe du Monde several times and the Biegnets are AMAZING! Yummy! Sound awesome! Thanks for sharing! I have not been to New Orleans either but have it on my list to visit! I, too, would like to visit Cafe Du Monde someday but stuck here in small town midwest, I’m missing Portland just a little bit more now. Portland is a pretty great place to live! Hopefully you’ll get back here some day soon!! Beignets are the best! Especially homemade ones. I made some filled with nutella and covered in chocolate hazelnut sauce! people went crazy for them! Yours look just beautiful! Tieghan – those sound absolutely amazing. Will totally have to check out your recipe. Oh yum, your beignets look so delicious! Yours look bette than the real thing 🙂 Just tried them last week for the first time. Thanks Jana – lucky you!! My mouth waters. I love beignets and yours look perfect! Hubs and I were in NOLA last month while he attended national Mercedes Benz meetings. We had cafe au lait and beignets at Cafe du Monde twice! Loved it so much, can’t wait to go back and spend time at the Cafe again. And yes, do NOT wear black while eating these! Yum! Who wouldn’t love these?! Pinning! I’m with you on the beignets! I’ve only had them in Savannah – never Cafe du Monde. Pinning! Oh the deliciousness. These look ridiculously good! Beignets are sooooooo wonderful. Yum. I haven’t had a beignet from Cafe Du Monde in almost 10 years & that’s way too long! I’m afraid if I start making these at home I’ll never be able to stop eating them! 🙂 Visiting from the LLR linky party. Visiting Cafe Du Monde is a goal of mine too…hmmm vacation is coming maybe a road trip is in order. I love beignets and especially from Cafe Du Monde. I was able to have them there many years ago and dream of visiting there again. Thanks for sharing on Foodie friends Friday. I need to make these soon. Pinning. Leigh Anne, I hope you do get to New Orleans and sit outside the Cafe du Monde…it is worth the trip to my favorite city in the country…and those beignets are delicious with a cup of chicory coffee…thinking of this makes me want to hop on a plane right now! oh nuts I just drooled on my keyboard! Thank you for sharing at the hop, your participation makes the hop extra special. Big Hugs P.S. the new giveaway will be posted tomorrow! I won’t pretend to be even half as good a cook as you must be to be able to make these!!! I have been to Cafe du Monde many times while visiting family or on our honeymoon, and they have beignets that will just make you wanna smack someone!!! They are THAT good!!!! I’m glad you have been able to recreate the feeling of hangin’ out on Bourbon Street, sipping a cup of chicory coffee, and drowning in the luscious flavor and cloud-like texture of a Cafe du Monde beignet!! They look beautiful! Leigh Anne, these look fabulous. 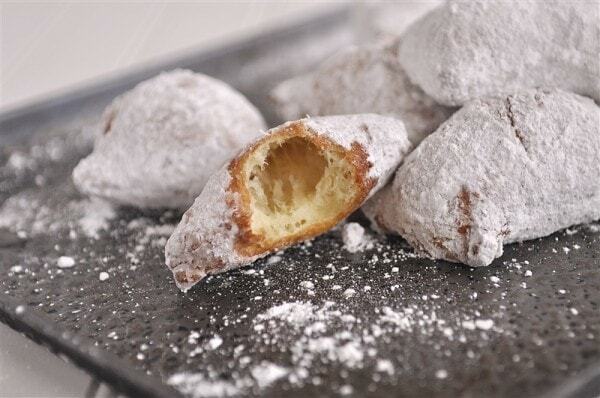 Funny, I recently made Beignets myself but I used a buttermilk recipe. Will have to give your recipe a try next time. 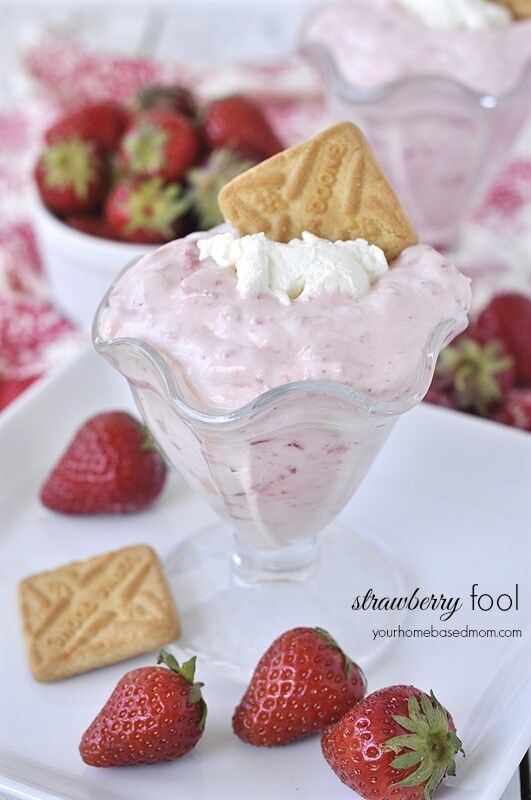 They are just so yummy and easy to make! Will be featuring you on my Facebook page this weekend! Pure deep fried bliss these bad boys are. Yours look amazing! Did my recent visit there inspire this post?!? I’ve never tried making them…I just assume they won’t come out as good. I actually made them back in early February but seeing your photos at Cafe du Monde reminded me I hadn’t posted the recipe yet!! With one of these in my mouth I would forget about a bucket list and enjoy the moment. 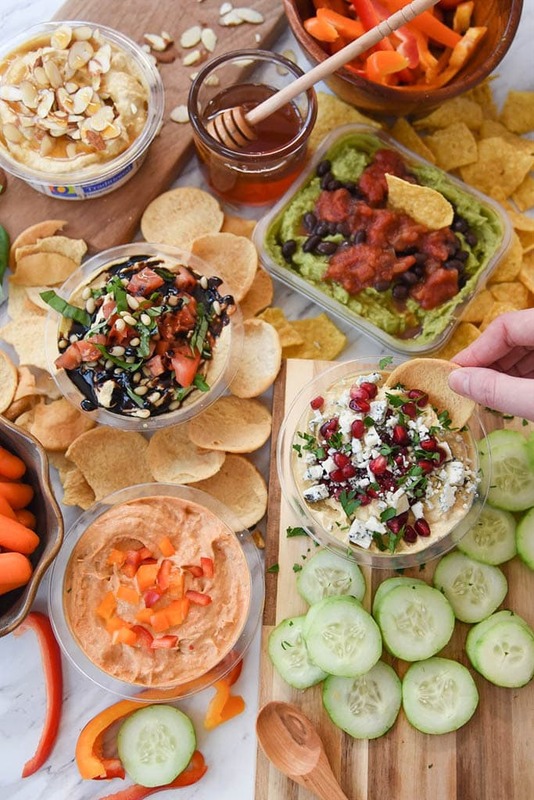 So glad you shared these on foodie friday. I have been clicking on them all week on other food parties they look so good. Je t’aime beignets, ce sont formidable et le blog est tres jolie. 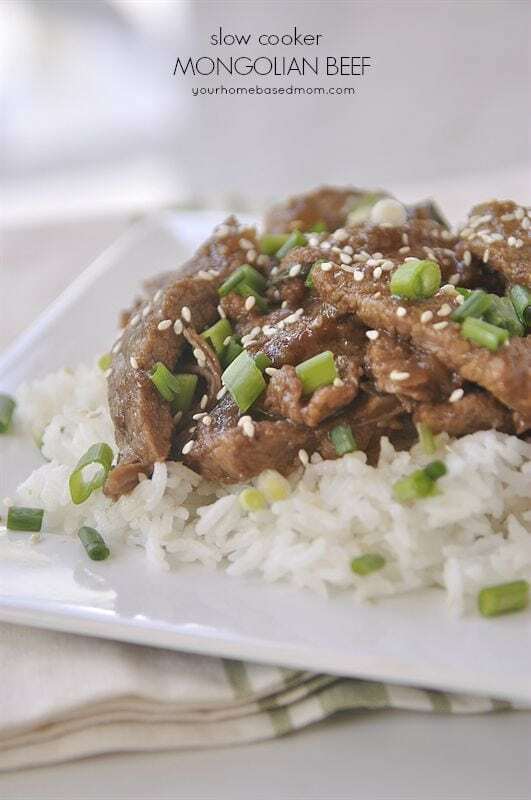 I just want to let you know that I picked this recipe as my host favorite. It will be featured in the Foodie Friends Friday Daily Dish Magazine on Monday. I will also be featuring it on my party post next week. Normally I try to make them before the party but as I am on a no sugar, no grain program this month ~ I probably won’t tempt myself. But I do plan on making them soon. Beignets just taste better in NOLA and Cafe du Monde makes the tastiest ones. Nothing outside of NOLA come close! NOLA is one of my favorite cities, especially for the food. Wine Country/San Francisco is on my food bucket list. Fabulous memories, and these look fabulous! Your recipe is awesome and thank you so much for sharing it at the table with Full Plate Thursday. Cafe du Monde beignets are really delicious. I made beignets for the first time last month and they were SO easy… much easier than donuts and just as good.I can’t wait to try this recipe! Ok, I am impressed. I assumed that beautiful teaser picture was of beignets actually from Cafe du Monde. These look delicious, your pictures are beautiful and your recipe almost makes me believe I could make these myself. YUM! what’s on my bucket list? making THESE! yummy yum yum!!! That sounds like my sort of cafe – open 24/7! All my cravings tend to hit at the weirdest hours of the day. Now if only I didn’t live the 10 hour flight away! 😆 I’ve never heard of these before but they look divine! I’d resist licking my lips until the last bite for all that wonderful build up of the powdered sugar – Mmm! 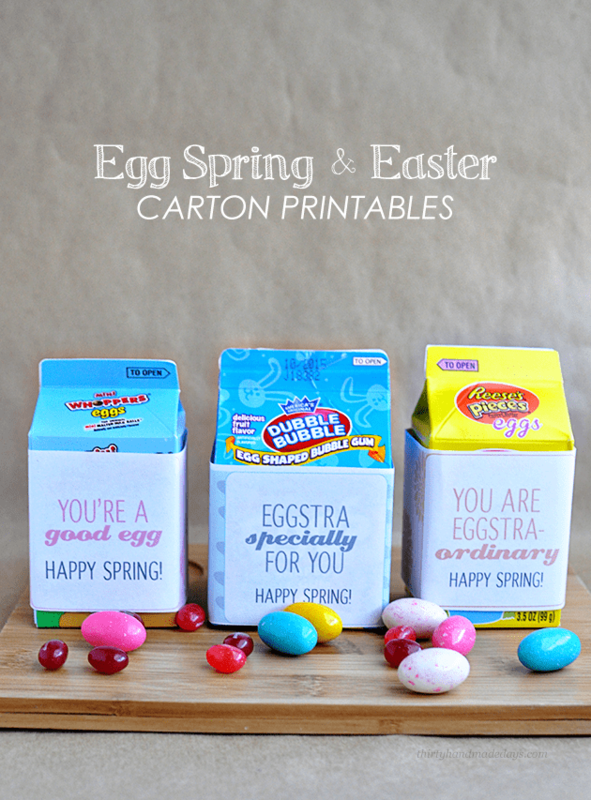 These are great and are being featured on todays Sugar & Slice Sunday link party. This looks fantastic. If I weren’t dieting right now (or still! lol) I’d be all over this one! Thanks for sharing and I hope you will link up your recipes with me at http://aroomfortwowithaview.com/recipes/simple-sunday-pot-roast/ for my TGIF Blog Hop! My recent post Simple Sunday Pot Roast for my TGIF Blog Hop! I had eaten Beignets many times over the years at Cafe Du Monde but the most exciting and emotional time was the first day they reopened after Hurricane Katrina. The staff and customers alike were laughing, crying and celebrating the rebirth of New Orleans. 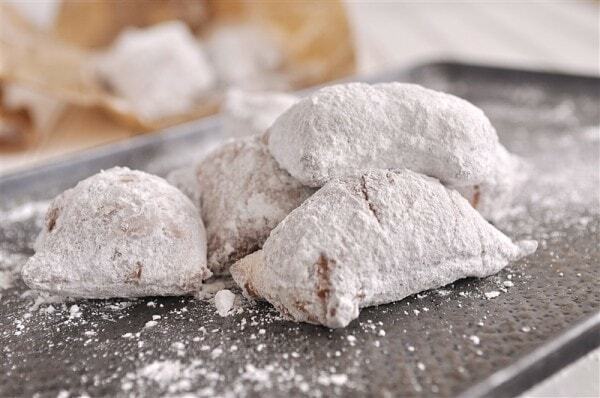 FYI… Sprinkle (LOTS) of powdered sugar on top of your Beignets. No paper bags! What an amazing experience! One you will never forget I am sure.. I think they would taste even better shaped as Mickey Mouse! Enjoy! Thanks for this recipe! I am from New Orleans and one of he things I miss the most are Beignets at Cafe Du Monde. As a kid, it was a tradition to blow the powdered sugar on everyone at your table. There are shakers on the table filled with powdered sugar, just in case you need more. My son as able to visit there last month and I was so jealous! It’s on my bucket list! I can’t believe you’ve never been to Cafe du Monde and had beignets! DId you know I grew up in New Orleans?? 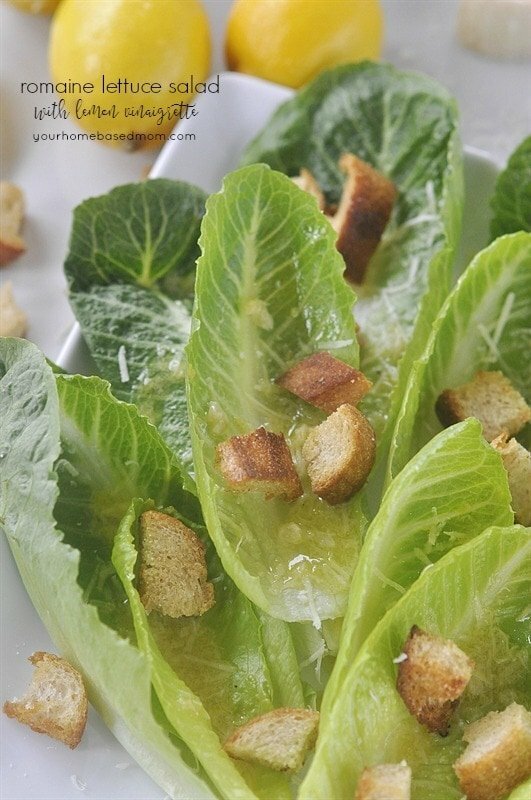 I crave these puppies, but I’ve never tried to make them-I’m scared to try, but I’m going to try this recipe! I have only been to New Orleans once – when I was about 10! Can’t believe I’ve never had their beignets either. Let me know if you try the recipe as I have never tasted the real thing but these are pretty darn good. Hope your family enjoys them! This recipe turned out perfectly! Thank you for it! I was in New Orleans for the first time a couple months ago and had so much fun and ate lots of delicious beignets! Visiting Cafe du Monde in New Orleans is on my bucket list! Just got back from a trip to NOLA and tried the Cafe duMonde and the Cafe Beignet beignets. I preferred the Cafe Beignet ones, larger, softer and tastier. The Cafe du Monde seemed heavier. Don’t get me wrong, both were great, but the popular tourist ones aren’t always the best! Can’t wait to try! Quick queation, if I refrigerate left over dough, can it go straight from fridge to fryer?